Washington is home to more than 8,000 lakes and nearly 170 rivers. Due to the prevalence of inland waters, boating and water sports are a favorite pastime for many Washingtonians. Unfortunately, boating comes with risks, especially when you add alcohol, high speeds, and flimsy inflatable tubes. 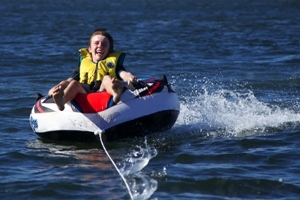 Water tubing, or “tubing” for short, is a recreational activity where one or more people sit or lie on an inner tube as it is dragged behind a speeding water vessel such as a boat or jet-ski. The inner tube is attached to the vessel by a rope, tether, or in some instances, a bungee-type chord. Think of it as water skiing while sitting down. The popularity of tubing has grown over the past decade as children, teens, and young adults continue to seek more and more adrenaline-fueled recreation. Unfortunately, as the popularity increases, so does the number of accidents and deaths associated with the dangerous activity. To put the risks of tubing into perspective, the Nationwide Children's Hospital conducted a study between 1991 and 2009, which monitored the increase of tubing accident injuries and accidents over a 19-year period. The results of this study showed that tubing-related injuries rose by nearly 250 percent over the course of two decades. This research proves that, although tubing may be an exhilarating activity, it can also be extremely dangerous if proper safety measures are not taken seriously. Be aware of potential threats. Although a lake or river may seem calm and smooth, the smallest rock cropping, seaweed patch, or floating branch can cause your tube to flip, capsize, or sail out of the water. Excessive turbulence from floating debris can also shake you out of your tube, causing you to skip painfully over the surface of the water with neck-breaking force. Wear protective gear. Although wearing a lot of safety gear can be cumbersome or distract from the adrenaline rush, lifejackets, helmets, whistles, and knee pads can wind up saving your life. Before you crawl into the tube, make sure you are well-equipped for an emergency. Know and accept your limitations. Just because your friends gambled with their lives by attempting flips or acrobatics does not mean that you need to follow suit. If you feel uncomfortable with the speed or turbulence, blow your whistle and have the boat driver slow down. Do not attempt dangerous feats, especially when you’re new to the activity. If you or a loved one has been injured as a result of a negligent tubing accident, contact attorney Andrew Kim today. Throughout his 25 year career, Andrew Kim has helped hundreds of clients, such as yourself, successfully build strong injury claims to receive the fair settlements their accidents warranted. Allow him to do the same for you. Call us at 1.800.636.3676, or fill out our convenient contact form to schedule your complimentary consultation. It’s time you got your affairs back on solid land. Call now! Post a Comment to "A Rise in WA Tubing Accidents Shows a Fall in Water Safety"